Different generations of Russians remember the turbulent events of August 1991 with a range of emotions dominated by uncertainty mixed with hope. Like many Russian children in August 1991, Ilya Poliveev experienced the drama of the failed coup against Soviet Leader Mikhail Gorbachev in his mother’s shocked expression as the family watched television news and his parents anxiously exchanged whispers. “I can still recall lots of images from the news: the Russian White House with black burn marks and the look on Gorbachev’s face, which essentially was the same as my mother’s,” recalled Poliveev, 26, who lived in Magadan in Russia’s Far North in 1991 and now works as a stylist in Moscow. Twenty years ago this month, between Aug. 19-21, Communist hardliners attempted to topple Gorbachev and thereby halt his reform program known as perestroika and a proposed reworking of the documents governing the Soviet Union. 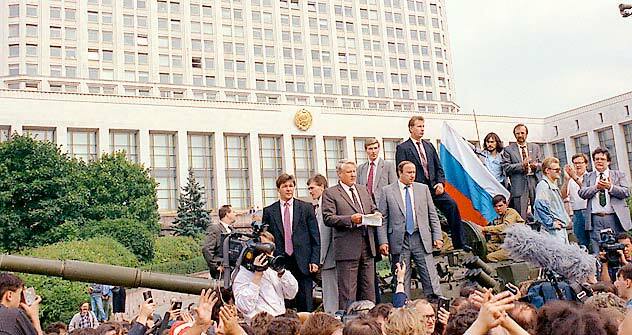 But the attempted putsch failed and Muscovites rallied around Boris Yeltsin, the president of the Russian republic, who famously stood on a tank outside the White House, the seat of the Russian government. Gorbachev, who had been placed under house arrest in the Crimea, returned to Moscow after Yeltsin’s successful stand, but he was fatally weakened as a leader and the dissolution of the Soviet Union began almost immediately. Vera Grant remembers digging for potatoes at her grandparents’ dacha near Moscow, and the adults intently listening to the radio, even in the fields. “The tension was thick,” said Grant, a 26-year-old concert promoter. But two decades after the founding of a new state, one that began with great hopes for democracy and prosperity, Russians are deeply ambivalent about what has been achieved in the intervening years and the current trajectory of their country. And that now colors their view of what happened in 1991, and whether it is worth celebrating. A mere eight percent of Russians look back on the events of August 1991, and the subsequent collapse of the Soviet Union, as a democratic revolution, according to the Levada Center, an independent polling agency. Thirty-six percent of Russians, echoing the sentiment of Russian Prime Minister Vladimir Putin, describe the fall of the Soviet Union as a tragedy and 43 percent dismissed what many see as a seminal moment in Russian history, the failure of the August coup, as nothing more than a power struggle among bureaucrats. “It was the illusion of freedom and the illusion of change,” said Philip Bochkov, now an art director. He recalled that his family crawled around their Moscow apartment during the coup because it was near the White House and his neighborhood was alive with rumors that snipers were on the roofs and randomly targeting people. Natalia Moshkina recalls a sense of jubilation in the crowds when her grandmother and mother took her to the White House for a rally after it was clear the coup had failed. He also noted that public hostility to the 1990s has been stoked by the Russian media, which has consistently described the decade as a period of unremitting chaos. “People became increasingly more disillusioned,” he said. But Dubin also noted that “democratic rhetoric has seeped into people’s pores” and the idea that democracy is a good thing has persisted as the principal legacy of the collapse of Communism. And Russians continue to aspire to the promises of twenty years ago, even if they are unsure how or if they can be achieved.